With so many free (or inexpensive) useful tech tools out there, editing video, audio, or photos doesn't have to cost a fortune – or leave you with a headache. If your digital media needs are simple, your tools can be simple, too. We rounded up the best ones for your consideration. Audacity: A simple, yet very effective, open-source multi-track audio editing software. You can import audio files, chop them up, fade them in and out, or use more advanced editing features, then export the entire project as an MP3 or WAV file. 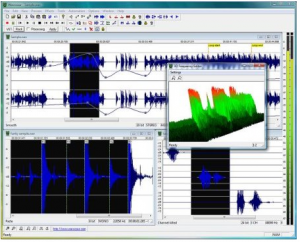 Audacity can be used with Windows, Mac, and Linux, is compatible with a variety of audio file formats, and can even convert analog audio to digital. Wavosaur: Although it only works on Windows operating systems and is barely half a megabyte in size, Wavosaur still has some pretty advanced features, like cross-fade loops, vocal removal, batch processing, and more. Ardour: Only designed for Mac and Linux, but crammed full of advanced features, this one might be a bit more complex to navigate. Called a "digital audio workstation" suitable for professionals, users can record, mix, and edit their audio cost-free – and consult the support feature if they get stuck. WavePad: Another full-featured audio editor full of effects like echo, amplify, or text-to-speech and voice-changer functions. It's also compatible with the full range of audio and music file formats. The free version is only available for Macs, however. Pixlr: Very popular and user-friendly, Pixlr lets you upload photos from your computer and edit them right in your browser. 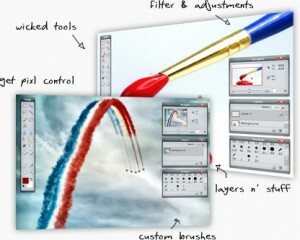 There are no downloads necessary, unless you want to grab and edit screenshots using Pixlr Grabber. For simple, one-click edits, try Pixlr Express; for "retro vintage" effects, visit Pixlr-o-matic. Picasa: Google's photo editing tool, Picasa is a free download, runs on every operating system, and allows any number of simple editing and organizing features. Reduce redeye, crop, retouch, make a slideshow, and batch upload, or share photos using Picasa Web Albums. Picnik: Edit photos online with this browser-based software; no downloads required here, either. Picnik, like Pixlr, has a lively, upbeat interface and offers access to special effects as well as simple edits like cropping and color retouching. For more advanced features, users can upgrade to the Premium version for a small fee per month. MovieMaker: The Microsoft version of Apple's iMovie, MovieMaker is a simple video editing software for Windows that turns photos and video clips into polished digital movies, using special effects, transitions, captions, sharing features, and more. Cinefx: An open-source digital media player and editor, Cinefx is compatible on both Windows and Mac operating systems and lets users navigate simple, yet professional, video editing features and add a bunch of special effects. MovieStorm: If you want to create 3D animated movies, this is the free download for you. MovieStorm's goal is to make 3D animation accessible to teachers and students, businesses, and amateur filmmakers, so it's easy to use, but full of high-quality, industry-standard features. StoryBoard Pro: Designed specifically for students and teachers by Bill Bierden, an Apple Distinguished Educator, StoryBoard Pro allows users to plan ahead for their video projects. Although it's not exactly about importing video footage and editing (it's more of a precursor to that), students can enter shot descriptions, planned lengths, and editing order, create and print storyboards, and upload a variety of media to illustrate each shot. PhotoStory: A free, Windows-only audio slide show software that allows users to upload photos and audio and add captions, narration, and transitions to make a smooth multimedia piece. When it's done, it's exportable as a Windows Media Video (WMV) file. Animoto: A very simple video or photo slide show software that's excellent for beginners. It can automatically sync up with Facebook, Flickr, Photobucket, SmugMug, and Picasa albums and allows users to upload music or select from Animoto's audio archive. Only the Lite version is free, however, which means that users can only create 30-second slide shows. Still, upgrading to Plus is only $5 a month or $30 a year. PhotoPeach: Also very simple – perhaps even simpler – PhotoPeach offers users the ability to upload and arrange photos, add music and captions, and share on Facebook, Twitter, or a blog.